A detailed Zanskar winter trekking guide and adventure notes on the Zanskar frozen river trek from Chilling to Nyerak and beyond, by Ryan Rodrigues, and more from Smart Travel Asia and Dancing Wolf Media. HOW difficult could a 45km hike, on a frozen river be? At a height of nearly 11,000ft, along the picturesque Zanskar Valley, meandering through a land where snow leopards sleep? Where winter temperatures dip to minus 24 degrees Celsius? And where mountain walls are as cold as ice and, should you fall, the water below is even colder? Not hard at all. Travellers of all persuasion are known to visit these remote spots in the northern reaches of the Indian Himalayas, tucked between Kashmir and Ladakh. It is a great summer getaway and Zanskar whitewater rafting is a huge adrenalin rush. Yet, in the depth of winter when saner people huddle over crackling fires around the living room hearth, we met an astronomer, solo trekkers, large tourist groups determined to acquire terminal frostbite, and petite young wives with doddering husbands. Not all were enamoured of the Big Chill. Porters told of a “chatty Indian woman” who, upon encountering her very first obstacle, demanded a full refund. And then there was the elderly Japanese couple who slipped so often on the ice that they quit in three hours flat. At least one trekker considered calling in a rescue chopper, an exercise that would flatten any corporate wallet with its US$3,265 heft. And that distress call would have to be pass word of mouth right up to Leh, Lingshed or Padum, where phone lines actually worked. Tough? Nah. 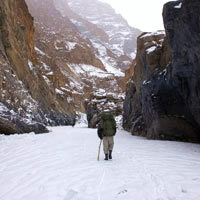 A winter Zanskar frozen river trek is also the most expensive hike India has to offer for men who will be boys. For the people of the region who live in medieval villages, a frozen river is a preferred shortcut to civilization. The only alternatives are the dangerous switchback trails wandering up and down the mountain passes (a road being built from Chilling to Padum will eventually render the frozen river obsolete). The iced surface is colloquially referred to as “chadar”, Hindi for sheet. School-going children use the river to hop and skip between villages. Local women, six months pregnant, trek to hospitals as far as Leh in three days flat. In comparison, the average trekker covers the same distance over four days or more. This is not the stuff of your average Zanskar fun guide but it is piquantly different. So what kind of trekking gear must one carry for this arduous undertaking? Local guides swear by Mammut winter wear, and Northface equipment. They don’t use (and can’t afford) either themselves, but you’ll find plenty of Chinese rip-offs in Leh (the capital city of Ladakh). More original alternatives are found in Delhi or Mumbai, where at least Quechua gear is easily available. Polyester ski pants guard against moist and cold winds (unlike cotton, they soak less and dry fast), and you’ll need at least two jackets – a warm feather jacket for the evenings and a fleece during the day. Thermals, thin and thick mitts, light thermal flask for a bottle, walking stick and at least a dozen warm woollen socks are a must. Also gumboots, a size larger, to allow enough space for an extra layer of woollen socks. Buy a muffler and defogging glasses to guard against sun glare and the snow's reflection. Carry dry fruits and lots of chocolates. Cameras and torches need back-up batteries as they drain faster in sub-zero temperatures. Like newborn babies, keep batteries close to your chest and warm at night. Carry medicine for every common illness you can think of. And consult a doctor before you venture up. Getting there is in itself an adventure. We arrived in Leh, and its breathtaking views mid January. Built by the army, Leh airport is small and heavily guarded. On your journey back you must check in even small backpacks, and batteries must be separated from cameras – the latter carried by hand. The only cabin concessions are a backpack full of camera equipment, or a lady's purse. For many, this may be the hardest part of the expedition. There is also a highway from Manali (in Himachal State) that ends in Leh, but people rarely drive up during the winter. Heavy snowfall blocks roads for weeks. Some have had to sell their cars in Leh as a result. It is necessary to stay in and rest on day one of your trip, so as to acclimatise to Leh’s altitude of an average 9,000ft. Without rest, altitude sickness will ruin every day and night that follows. It is an unhappy cocktail of dizzy fatigue, headaches and tummy wobbles. Electricity supply in Leh is erratic at best so charge your batteries constantly. And expect wet wipes and sunscreen lotions – any concoction with liquid in it – to turn to ice. Unlike the frozen river trek, rafting is a more popular sport during the summer months. Tour operators offer expeditions along the Zanskar and Indus Rivers. Chilling, where the uphill frozen river trek begins, is the same place where river rafting along the Zanskar ends. Rimo Expeditions and Aqua Terra are among the better known tour organisers in these areas. We travelled with Peak Adventure, a [Delhi] Noida-based tour organiser that has been around since 1989. But, as we learnt the hard way, organisers of such trips in faraway Delhi suffer from some serious drawbacks. While Delhi is responsible for marketing and payment collections, the trek is conducted by other Leh-based agencies that may not deliver on all the sales promises. Our meals were meant to be “a mix of Indian, Chinese, Continental and Ladakhi”. What we got were meals for vegetarians made from pasta and penne from instant-food packets. Indian and Ladakhi food were on the menu, but made only rare appearances. The highlight of many forgettable meals remained that old MSG-infused staple: Maggi noodles. It is maybe unreasonable to expect freshly cooked meals on a trek like this. But our itinerary – prepared by someone who had never been there before – served up a host of errors. Campsite Zaribago got replaced with Tsomo. A stayover at Chilling was skipped altogether. “Coppersmith workshops” in Chilling were closed because there happened to be just one solitary workshop open in the village. A “one hour walk” turned into a steep, four-hour climb. And nobody – not even the competition – warns you about Umah (but more on that later). I am told the itineraries have been subsequently overhauled. Old timers in Leh say that if you want impeccable service, go to Project Himalaya. 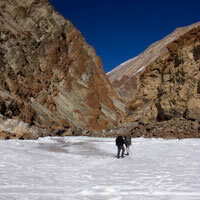 Project Himalaya offers just one 20-day frozen river trek between Chilling and Padum. As one of the longest options on offer, this Zanskar trek costs more than US$2,551 (Rs125,000). 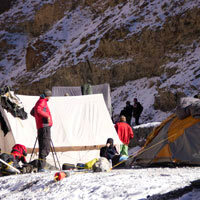 Agencies like Peak Adventure charge $1,000 (Rs49,000) for a 10-day trek between Lingshed and Chilling. While Chilling is the starting point for all hikes in the region, there are different treks and paths to be taken, all of which vary in degrees of difficulty and duration. The strongest of heart will trek for 10 days to Padum, the largest town in the Zanskar region. A second option takes you to Lingshed over a shorter, five-day trek. Lingshed is an old, 85-mudhouse village situated at roughly 12,000ft and, unlike on the Padum route, you have to leave the river and start climbing up a frozen stream to get there. 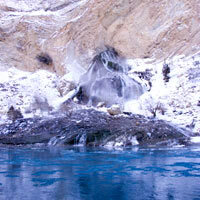 The most popular Zanskar winter trek, however, is the shorter three to four-day trip between Chilling and Nyerak. Indian travel agencies charge about US$410 (Rs20,000) per head for such trips. Our most memorable moments on our Zanskar frozen river trek however were found well beyond Nyerak. The relative danger on treks up to Nyerak is far lower, but so too is the fun. Press on for enlightenment. The larger the group, the more pressure put on the icy hiking paths. Smaller groups are more likely to cross spots where ice formations are weak; while larger groups simply won’t risk it. They are more likely to camp the night – we saw this happen – only to return home the next day, irrespective of the distances promised on paper. This is one area, where Peak Adventure has got it right. We were three trekkers, with eight porters, a guide and chef. We arrived perfectly on time, well before the competing crowds. Our ice was fresh and unbroken all the way to Lingshed. You cannot attach a price to such luxury. On day one we rested in Leh while day two offered some excitement. 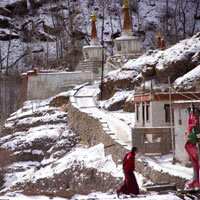 Most tour operators accommodate acclimatisation time by visits to monasteries on the second day. We travelled to the monastery in Hemis, and then to Thiksey and Shey on the way back. If planned well, the trek can be timed with local celebrations (leh.nic.in) held at some of these monasteries. On day three with our belongings packed, we met with our guide and chef at 9am. Regular sleeping bags do not keep out the cold at such low temperatures, so we rented more sturdy gear at US$3 (Rs150). Indian Army sleeping bags rented out in Leh are bulky and double layered. Not only do they work fabulously well, but you won’t even need to carry them, as porters inherit that unenviable task. The road to Chilling is a three-hour drive on a road that cuts through desert landscape. We passed Magnetic Hill along the way, and the confluence of the Zanskar and the Indus rivers around Nimmu village. Five rivers, including the Zanskar, empty into the Indus which twists and turns till it reaches Pakistan. Glimpses of the frozen river begin to appear after the passes at Nimmu. Large swathes of white ice sheet along the valley, for kilometres at a stretch, make sudden appearances. It’s a scene straight out of Narnia. Energy levels within the car started to soar. Ice on the Zanskar River begins to freeze in December. By January the ice is on average four feet thick with areas solid enough to carry loaded trucks. 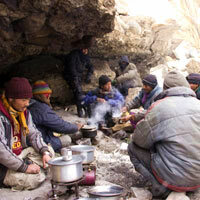 In Chilling, a team of eight porters met us. We were all set for our Zanskar frozen river trek. Porters are farmers by summer, and hiring one during those months is more expensive than in the winters. 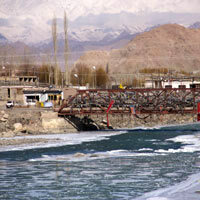 More than 2,500 men from Zanskar are employed on the river during the winter months. They charge US$9 (Rs450) per day – and bring their own supplies including food, stove and kerosene. The first steps on a frozen river can be a tough balancing act for anyone. You must hope that snow will fall for you in the right quantities. Too little snow makes the ice tough to walk on. Too much snow, on the other hand, makes it harder to identify thick from thin ice. Falling on ice hurts hardest on the rear, and you must be extra careful on thin ice. There’s a trick to walking on ice: to walk you don’t lift your legs at all. Instead, like skating you simply slide them from side to side. Despite the temperatures, the cold won’t hit you while walking – an average five hours a day. In fact, dressing up too much will leave you sweating under the jacket. It is freezing cold only when camped – and especially so during the evenings and early mornings. From Chilling we headed to our first camping ground of Tilatdo, which is barely a one hour walk. This is the shortest walk of the trek, and partly allows for a third day of acclimatisation. A group had beaten us to a solitary cave at Tilatdo. So we camped out in the open, which was not necessarily a bad thing. While a cave protects you from cold winds outside, and possible rock slides at night, trekkers and porters also light bonfires in them – causing ash and soot to fly all over the place. On the other hand, tents can be strategically placed around boulders – further away from mountain walls – which offer sufficient protection from cold winds. What cannot be avoided, however, is the accumulation of moisture within the tent. Warm air rises to the tent’s roof, where cold air on the outside causes moisture to form droplets on the inside. By morning there are loose crystals of ice on the inside of the tent’s roof. Moisture’s effect on the sleeping bag is radically different around the face area – it turns into water, leaving the bag with large, wet patches by morning. This is, perhaps, the most annoying natural occurrence on the trip. You will find yourself waiting to dry your belongings – shoes, sleeping bags and smelly socks – as soon as the sun is up. We also soon accepted that the fun of this trip lies in the walking, however arduous. It’s a constant battle, adjusting your speed with that of the guide's. Porters, cooks and guides get paid by the day, and the trek isn’t a holiday to them. While following your guide is a strict rule, it took some argument, and coaxing, to get the guide to quit racing. He "walked" with us for the rest of the journey. There’s a good 13 hours of darkness in between daylight hours, a large part of which must be passed in sleep. At times like these, having a companion helps. A pack of cards or maybe a book to read. We woke up every morning to a glass of warm water. Then the breakfast. Eggs, bought in Leh, had been cracked open and yolks and whites packed into a bottle for the rest of the trip. Breakfast starts with tea, coffee, hot chocolate or milk, and a warm soup, followed by either sweet pancakes, scrambled eggs or jam with rotis. Your porters will not eat before you do. This is emotional blackmail. You must wake up early if only to keep the team from staying hungry. By 9am we were all set to go. The guide changed the itinerary and we headed to Tsomo instead of Zaribago. We were told Zaribago required a detour. Tsomo, however, was no disappointment. This is a waterfall that emerges from a tiny opening in the mountain wall. Unlike all other waterfalls in the area, it is fed by a hot water spring somewhere deep within the mountain. In a vast expanse of ice and snow, Tsomo looks magical and never freezes. Early next morning we were up and ready to head towards Deep, which took about four hours to get to. By now, we had crawled under mountains on ice two feet wide, and walked on ice sheets that stretched till the horizon. This was also the only stretch where we spotted snow leopard pugmarks. And it was as lucky as we would get. It is difficult to imagine someone spotting a snow leopard in the open, camouflaged as it would be against the white of the landscape. These leopards also stay clear of humans, and will step down to cross the river only late at night. Wildlife enthusiasts camp for 15 days at a stretch, hoping for a lucky day when a leopard may surface for an hour or two. The highlight that evening was a noisy avalanche. Ten minutes after we had camped at Deep we heard rumbling sounds from behind. The avalanche, which went on for the longest two minutes, caught everyone’s attention. By the time it passed, the ice sheet below had been torn to bits. Our destination the next morning was Nyerak, where we saw the first sign of human settlement, and a shop. There’s a century-old juniper tree along the way, called Shukpa, laden with prayer flags. It is far bigger than any of the other shrub-size trees you’ll find along the way. The Shukpa’s dry, tiny, needle-point leaves smell of incense when burned; and they are used as prayer offerings at Buddhist monasteries. On the way to Nyerak we also passed a massive frozen waterfall, distinctive by its twin outlets. Nyerak was something else. We met the octogenarian Bullu here, who built his mud house above the banks of the river 50 years back. Bullu travels down to the river every morning to fetch his water, collects dry wood and stays alone. He speaks more than four languages and hasn’t fallen ill, not even a cold, in over a decade. That night we bought bottles of rum at US$7 (Rs330) each (thrice the price in Leh), chocolates, and packets of biscuits for the porters. In return they took us to a local peak that offered a bird’s-eye view of the river below. For about $8 (Rs400), for the first time in days, we slept in a rented mud room atop the peak. Early next morning, we began the last leg of our trek to Lingshed. Twenty minutes into the walk from Nyerak is a spot called Umah. Though the river flows eerily slowly here, ice formations are always weak as there is a hot water spring below. The army has fitted iron rods into the mountain walls here, at more than one location, should the ice disappear altogether. We were lucky, with the ice formation that day. The ice creaked louder than usual as we passed by, but it held strong. We had passed our first test. An hour later, for the first time, we parted ways with the river (trekkers to Padum continue on along its banks). From here we began a steep four-hour climb along a frozen stream right up to Lingshed. For the first time also, we switched our gumboots for fancy shoes. You need them on the mountains, with their better grips for climbing. The climb is tiring, on a muddy path that winds through avalanche prone territory. These narrow paths curve along high mountain walls. You’re constantly climbing a valley where yaks graze. There are times where the path is covered with frothy ice (caused by snow slides), or there is no path at all. The effort was well worth it when we finally reached Lingshed – sapped of all energy. That evening we stayed back for an extra day in the cosy comfort of a one-storey house with large glass windows that allowed for a lot of sunlight. Lingshed is a village lost in time – it has monasteries for nuns and monks, and a school for children till the 10th standard. Lingshed also has – hold your breath – a satellite phone. Run by the Indian government, charges here are subsidised. It cost us about seven cents (Rs3) for a local call. But it works on solar power (pray for some sun) and you have to stand in line. Lingshed’s villagers rear ponies, donkeys, yaks and furry goats. They offer a room in their homes for US$16 (Rs976) a day, and their hospitality and love for visitors is unadulterated. Random passersby will invite you over for lunch or dinner. You wake up in the mornings to donkeys braying, horses neighing, yaks snorting. Lingshed has been in existence for over a thousand years. That night, the porters assembled around a large bonfire for a dance that would last till early morning. The return from Lingshed, a constant descent, turned out to be a lot faster than travelling up to it. We covered the journey to the frozen river – which took us over four hours earlier – in under an hour, and spotted a few ibex along the way. We got delayed, however, at Umah. On a bad day, Umah can test the nerves of trapeze artists. We were no slouches by the time we had negotiated the broken ice and helpfully placed iron rods. We reached Nyerak late afternoon, tired but safe. The journey onwards from Nyerak was speedy. We chose to spend our final night at Tilatdo. On the drive back to Leh, our guide commented, "Sir, you are all weak". No insult was intended. And none was taken. After days of toil and frozen endeavour, I felt like Superman. We all did. Names: Nyerak is also called Nyerakpulu, Deep is called Deekyokma and Tsomo is called Tsomopaldar. But very few people call them by these names. Exchange rate: US$1 = Rs61. Trek organisers tend to have separate charges for non-Indians, usually denominated in euros. Bring small denomination Indian rupees with you if possible. Credit cards are not customarily used in Ladakh, although some better hotels do accept them. There are a few moneychangers in the market and some bigger banks. It is customary to tip people who help you: tour guides, waiters, porters, and drivers. Safety: It is advised to register personal information and plans your embassy. Buy travel insurance that covers the cost of helicopter rescue. While the cost of a helicopter evacuation is about Rs80,000 one way, you must pay for a two-way trip. Trekking and camping permit: The frozen river trek does not need one. But treks along several mountain ranges, especially along the Indian borders, need "inner line" permits. The cost ranges from Rs100 to Rs1,500, and hotels and guesthouses can arrange this for a fee. Renting gear: Some organisers charge up to Rs150 per day for a double layered, sleeping bag. Depending on your package and negotiations, others offer it for free. There's a fixed Rs100 charge for hiring protective gaiters for the legs. Gumboots can be purchased from the market for about Rs300. Yak wool socks start from US$2 each. Walking sticks are at times part of the deal, and must be returned when the trek ends. Photography: Photo-taking at monasteries is usually permitted. But taking pictures with a flash is strictly prohibited. There is also no entry fee for monasteries. See our Ladakh guide. For more information visit Leh's official website at leh.nic.in. Also Reach Ladakh (reachladakh.com). The excellent Incredible India (www.incredibleindia.org) website has some interesting material and visuals on Ladakh and Leh. Ibex Expeditions. Tel: [91-11] 2646-0244, 2646-0246, (e-mail: ibex@ibexexpeditions.com or www.ibexexpeditions.com). 30 Community Centre, East of Kailash, New Delhi 110065, India. Project Himalaya. Tel: [97-71] 441-8100 and 441-8400, (e-mail: info@project-himalaya.com or www.project-himalaya.com), Amrit Marg, Bhagwan Bahal, Thamel, GPO Box 4902, Kathmandu, Nepal. Peak Adventure. Tel:  120-405-2615/99, (e-mail: peakadv@vsnl.com or www.peakadventuretour.com). A-60, second floor, sector 2, Noida, 201301, India. Spiritual Trek. Tel:  1982-251701, (e-mail: spiritualtrek@yahoo.com or www.spiritualtrekladakh.com). Tundup Namgial, Changspa Road, Opposite Moravian Misson School, PO Box 86, 194101, Ladakh, India. qua Terra. Tel: [91-11] 2921-2641, 2921-2760, (e-mail: avilash@aquaterra.in or www.treknraft.com). S-507, Ground Floor, Greater Kailash - II, New Delhi 110048, India. Rimo Expeditions. Tel: [91-124] 280-6027/28/29, Fax: 280-6030 (e-mail: info@rimoexpeditions.com or www.rimoexpeditions.com). Hotel Kanglhachen Complex, Leh, Ladakh 194101, India. Little Tibet Expeditions. Tel:  1982-252-951, (e-mail: ladakhtours@gmail.com or www.littletibetladakh.com). Main Bazaar, Leh, Ladakh, 194101, India. Ultimate Destinations. Tel:  99069-83215, (e-mail: ud_himalaya@yahoo.com or www.ultimatedestinations.in). 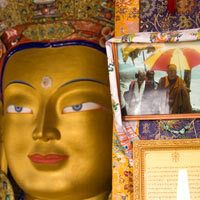 Tsering Angchok, Gangba Complex, Changspa Road, Leh, Ladakh, India.